High end style and function without the high end price tag! 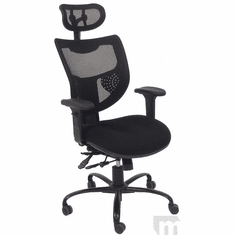 Our Executive Elastic Mesh Ergonomic Chair w/Headrest provided all of support, comfortable, durability and adjustments your more expensive name brand chairs. 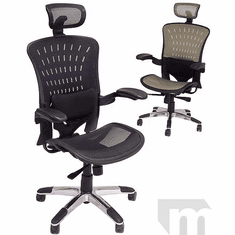 Edgy design features include a combo Charcoal Gray and Black woven elastic mesh, curvaceous black frame and an eye-catching chrome base. Commercially rated! 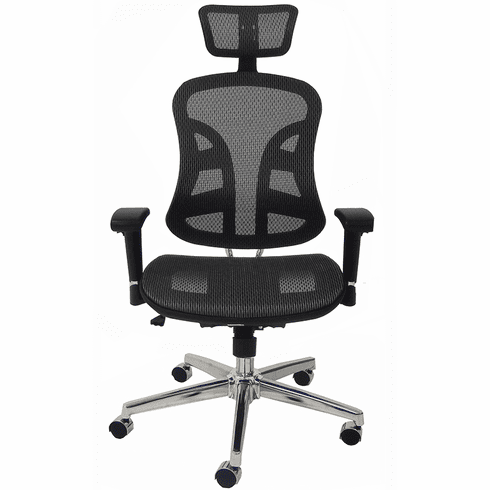 This chair is ideal for use as an all day work chair (8 hours a day, 40 hours a week), as a conference room chair or for home office. Rated for users up to 250 lbs. Functions include a gas lift height adjustment and 2:1 synchro tilt between the seat and back for a more relaxing recline. Back moves two degrees to every one degree of seat tilt almost eliminating pressure in the hamstring area. Tilt has an infinite lock to lock in any angle desired, or, leave in free float. A spring tension control adjusts the tilt tension to the individual user's weight. Urethane padded armrests are extremely comfortable on the forearms, and easily move with trigger release height adjustability. The supportive head/neck extension pivots to meet the head/neck area of various height users. Steel base for strength and standard with dual wheel carpet casters. Optional soft casters for hard floors sold separately below. Measures 26"W x 26"D x 46"-50"H overall. Seat measures 20-1/2"W x 19-1/2"D x 18"-22"H. Back is 18-1/2"W x 22"H (29"H from seat to top of headrest). Ships unassembled. Shipping weight 48 lbs. All components exceed ANSI/BIFMA commercial use requirements. Meets CA fire foam approval. 5-Year Limited Warranty. PRICE INCLUDES SHIPPING! IN STOCK!